Included is a compilation of clips chosen by APOIAF listeners, of their favourite podcast moments from all 118 episodes of APOIAF. [MP3] Download or play this episode directly. [Archive.org] View this episode’s page on Archive.org. 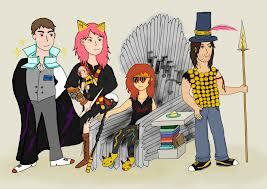 This entry was posted in A Song of Ice and Fire, Fandom, Podcast and tagged Dagos_Rivers, Erinyes, Nadia, Vaarsuvius. Bookmark the permalink. VoK podcasts are licensed under a Creative Commons Attribution-NonCommercial-NoDerivs 3.0 Unported License.